In Iain Reid’s second haunting philosophical puzzle of a novel, set in the near future, Junior and Henrietta live a comfortable, solitary life on their farm, far from the city lights, but in close quarters with each other. One day, a stranger from the city arrives with alarming news: Junior has been randomly selected to travel far away from the farm . . . very far away. The most unusual part? Arrangements have already been made so that when he leaves, Henrietta won't have a chance to miss him, because she won't be left alone—not even for a moment. Henrietta will have company. Familiar company. 1. Reid chooses to quote Leonora Carrington’s The Hearing Trumpet in the novel’s epigraph: “One has to be careful what one takes when one goes away forever.” Discuss the significance of this quote in relation to the book. 2. Is the future Foe depicts believable? Why or why not? Would you classify it as a dystopia? 3. Discuss the character of Terrance. What are some ways that the author keeps us guessing about his true nature? Do we feel like we come to know him any better at the novel’s end than we did at the beginning? He repeatedly insists Junior must trust him, but do we ever trust him as readers? 4. Discuss Junior and Hen’s relationship. Even though Junior constantly reiterates his love and devotion to Hen, do you think he truly loves her? Compare Hen’s personality to her actions and speech versus what Junior tells us about her. 5. “When you get significant news, unexpected, shocking, potentially life-altering news, as we did when Terrance arrived, it has a peculiar effect on everything, especially on how you think and order your thoughts” (p. 48). Do you agree? If so, can you think of an example from your own life to share with your book group? 6. Do you agree with Junior’s claim that “you can hold beliefs and not always believe in them”? (p. 57). 7. Terrance claims that being selected for OuterMore’s mission gives you “a chance to be a better version of yourself” (p. 71). Do you think this is accurate? What do you think the true purpose of OuterMore is? 8. Almost the entire book takes place at Junior and Hen’s farm; the mill where Junior works serves as the only other notable setting. What is the effect of this on the reading experience? Discuss the differences between the environment of the mill and the environment of the farm. 9. What do you make of Junior’s reaction to the rhinoceros beetle? What is the significance of the beetles? 10. “Being alone, it’s a tricky thing. It’s good for us, in small doses, but not for a prolonged period. And not when you’re not used to it” (p. 178). Discuss the ways the theme of isolation constantly reappears throughout Foe. In what ways are Junior, Hen, and Terrance isolated—from themselves, their society, and one another? 11. In what he claims to be “engineer humor,” Terrance refers to two of his cameras as “Flotsam” and “Jetsam” (p. 221). Look up the definition of these two words and then discuss in relation to the novel. Could this be a clue into Terrance and OuterMore’s true intentions? 12. Junior says, “I’m an individual. I’m unprecedented and unimaginable. I’m impossible,” (p. 323). Considering what happens between him and Hen, what do you think makes any being “individual”? 13. “I’m a flawed, disgusting person like everyone else. Broken and imperfect. Of course I am. How could I ever think I was any different?” (p. 361). Like Junior, do you think possessing flaws makes an individual more “real”? 14. How does the relationship between Hen and Junior change over the course of the story? 15. Who—or what—do you think is the titular “foe”? 1. Consider reading Iain Reid’s first novel, I’m Thinking of Ending Things, with your book club. Do you notice any similar themes or motifs to Foe? 2. 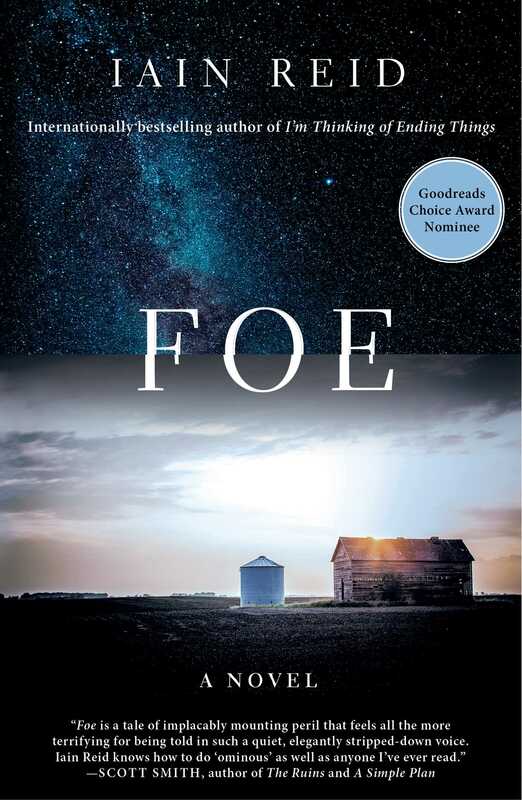 The film rights to Foe have been optioned by Anonymous Content, the production company behind the Oscar-winning films Spotlight and The Revenant. Discuss whom you would cast as Hen, Junior, and Terrance. 3. Immerse yourself in the world of Foe—pretend you’re in Junior’s place, and have been selected by OuterMore to go to space. How would you feel about your mission? How would you prepare? What personal qualities and intimate memories would you instill in your replacement? Discuss with your book club.